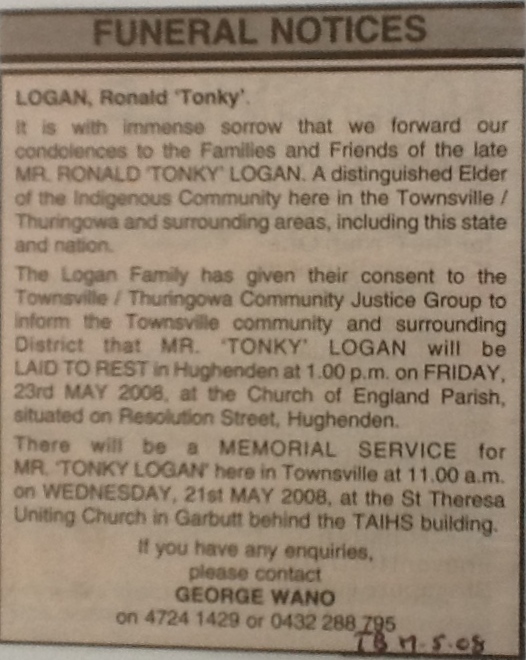 Tonky was born in Hughenden in 1952, but grew up in the Woorabinda district of central Queensland. Tonky sporting prowess included playing football, buckjumping, track racing, boxing, and cricket and he was an excellent stockman. 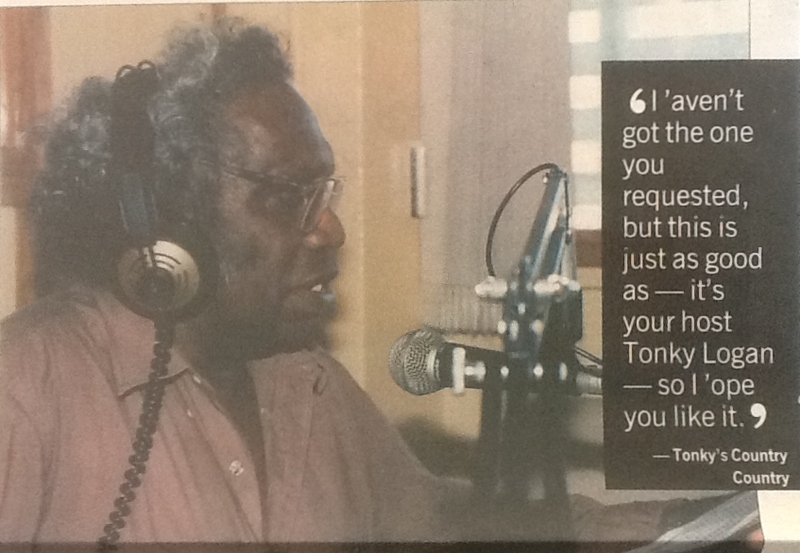 Tonky’s early singing days began with an old uncle at Woorabinda showing him a few chords. Later, in Hughenden, his guitar skill became the great love of his life. After giving up the alcohol with rehabilitation, Tonky knew he had go straight back to music to give him a reason to live. Legendary Aboriginal elder, singer, songwriter, radio presenter, and community leader Ronald “Tonky” Logan walked the path of reconciliation and service to the community with a big heart, wide smile, and generous spirit. Tonky was well known for saying, “What has happened has happened and nobody can change but we can work together to improve this”. For many years Tonky had an active involvement with the Murri Court, Community Justice as a community Elder and Community Patrol. From the beginning of the development of the Cultural Fest Tonky became a pillar of support, a keen and reliable team member and a champion of Unity in Diversity. “His knowledge of Aboriginal culture and his wisdom in sharing this through his beautiful music was like a bright torch that led our way in developing Cultural Fest”. Dr Daliri said. 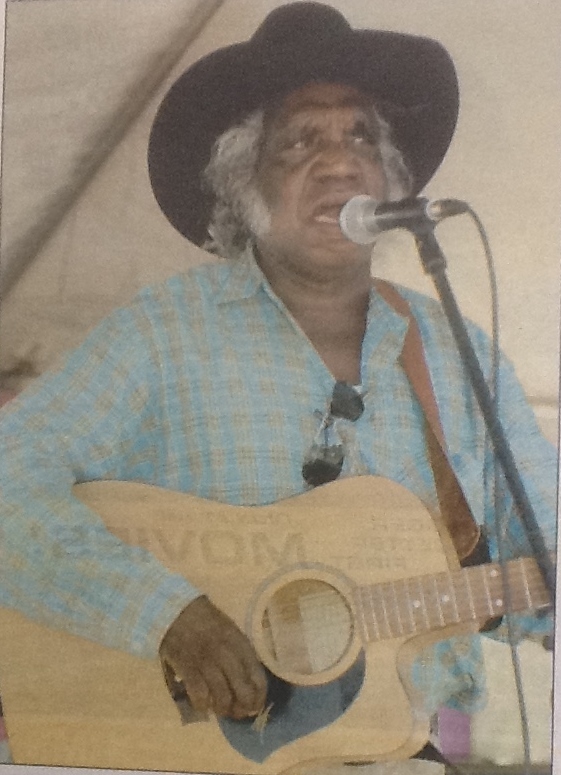 In honour of Tonky’s life, the Cultural Fest introduced a perpetual Tonky Logan award for the winner of the annual Idol competition. About fifteen years ago (approx. 1993) radio station 4K1G wanted to introduce country music but the staff at the time had no knowledge of the genre. It was decided to ask Tonky to host a country hour – not that they thought he was a country music buff but because he looked the part. Brown pants, blue shirt, cowboy hat, and cowboy boots – surely someone dressed like that must have some country music background. Tonky did not hesitate when asked – he didn’t let his lack of on-air radio experience get in the way of playing country and western music each week. Tonky’s Country Country show grew longer as the years went, from one hour to two, to three and then to four hours. His program was so popular, it commanded airplay through the National Indigenous Radio Service. From day one to his last on-air show in 2006, Tonky always sat at the other side of the console. He never once panelled his own show. Some of his most memorable performances included the Helping Our Kids Concert in 1995, the Reconciliation Concert with Troy Cassar-Daly on the Strand in 1996, the Community Concert at the Thuringowa Soundshell in 2004, and the yearly Reconciliation Concert with the Cultural Fest.